This is a sponsored post written by me on behalf of Klement’s Sausage Company for IZEA. All opinions are 100% mine. We love tasty salads. Don’t you? Think about it–salads scream made with fresh ingredients and flavor. Oh, that flavor! One of our favorite things about making salads is that it is SO easy to make things new…to create a unique recipe that becomes a new family favorite. Those are moments–and recipes–to be enjoyed. 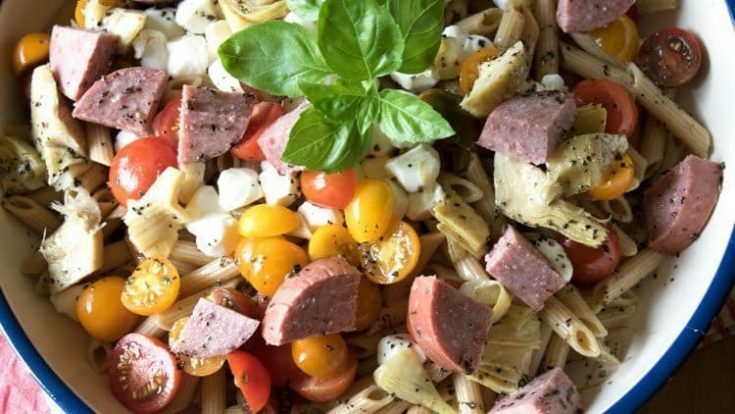 Sharing special moments with family and friends by enjoying our Caprese Pasta Salad with Artisanal Sausage handcrafted by Klement’s Sausage Company–well, those are moments to be cherished. See, the funny thing is that although I’ve lived in Wisconsin for the last 8+ years now, I wasn’t raised in Wisconsin. However…making recipes with ingredients that are made in the state I live–that’s something I like to do whenever I can. And knowing that Klement’s is made in Milwaukee–well, that’s a city I grew up hearing about on a regular basis because my mom lived there for a while. She moved there with her sister after high school–because my mom and her many brothers and sisters (a dozen of them in all!) were raised in Wisconsin. The traditions of Wisconsin has never been far from my roots–no matter how far away from the state I’ve actually lived. I’m not sure how many years back my own family story in Wisconsin dates back, but the Klement’s Sausage story began 60 years ago when three brothers- John, George and Ron Klement purchased a small sausage company in South Milwaukee. Makes me wonder if any of my family ever worked there–or if they didn’t, maybe they knew somebody who did. I love hearing stories about how small businesses got started. Especially local business. Klement’s started as small 6-person operation, but haven’t lost sight of what made their family business a success. Hard work, dedication, and perfectly seasoned sausage. We absolutely love the Old World quality and robust flavor that is Klement’s Beef Summer Sausages, which is exactly our reasoning for using that ingredient in this recipe. The authentic European handcrafted taste that Klement’s offers is delicious year round. Need the PERFECT salad recipe to bring to a block party or potluck? We’ve got you covered. Whether you decide to try our Caprese Pasta Salad with Sausage, one of our Slimming Salads or make a meat and cheese platter–bringing something to the table to share is what its all about when you’re socializing with family, friends and neighbors. Maybe you’d like to bring a dessert as well? Banana Cream Dessert and Cool Strawberry Whipped Dessert are two desserts you won’t soon forget. They are simple to make and offer a wonderful presentation. And did we mention the flavor? Prepare penne according to package instructions. Drain water and rinse with cold water to cool off. Combine all ingredients in salad bowl and drizzle with olive oil. Toss and serve.